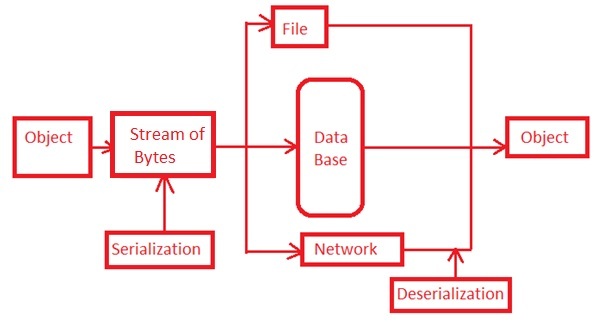 Serialization is converting object to stream of bytes. It is a process of bringing an object into a form that it can be written on stream. It's the process of converting the object into a form so that it can be stored on a file, database or memory. It is transferred across the network. Main purpose is to save the state of the object. First, we go and import the name space for serialization. Convert "customer obj" to binary. Also, need the "using System.IO;"create the file or read to file. Most important, go and mark the "class". Passing an object from one application to another. Passing an object from one domain to another. File in created to given the drive. Deserialization is converting stream of byte to object. Deserialization is the reverse process of serialization. It is the process of getting back the serialization object (so that) it can be loaded into memory. It lives the state of the object by setting properties, fields etc. Reverse the data from the file.